Every spring and fall, youth travel on buses and trains from all over China for a weekend of fun-filled church camp. With Beautifully Broken: Spring 2019 coming up in May, I thought it would be great to hear from a couple of regulars at camp so we can find out what exactly happens on these weekends and why we should get involved. Joining us today are Lukas (18) and Jeannie (15). So guys, how many times have you been to youth camp? Lukas: My first camp was Hashtag: Fall 2013, so I’ve been to roughly 10. Jeannie: Three, so far. Unmasked: Fall 2016, Calibrate: Spring 2018, and Kingdom Come: Fall 2018. Jeannie on a hike at camp. You guys are experts by now! Can you tell us what a typical camp weekend looks like? Lukas: So the buses come in and you find your cabin, meet your cabinmates, and your leader. Then everyone assembles and you get assigned to a color team. Each team then creates a flag, a chant, and a skit. Worship is incredibly done, and campers spend time together singing. A speaker always teaches about the camp theme and campers discuss the messages in their cabins during cabin time. Jeannie: During the rest of the day, there’s more sessions (similar to preaching, but geared towards us TCKs (Third Culture Kids), games (super crazy, sometimes messy, but always fun), free time (which can be spent playing gaga ball, nine square, or other activities), and cabin time (with your leaders and cabinmates talking through questions related to the sessions). In the evening there’s the night game, which is usually similar to Capture the Flag and always involves glowsticks. 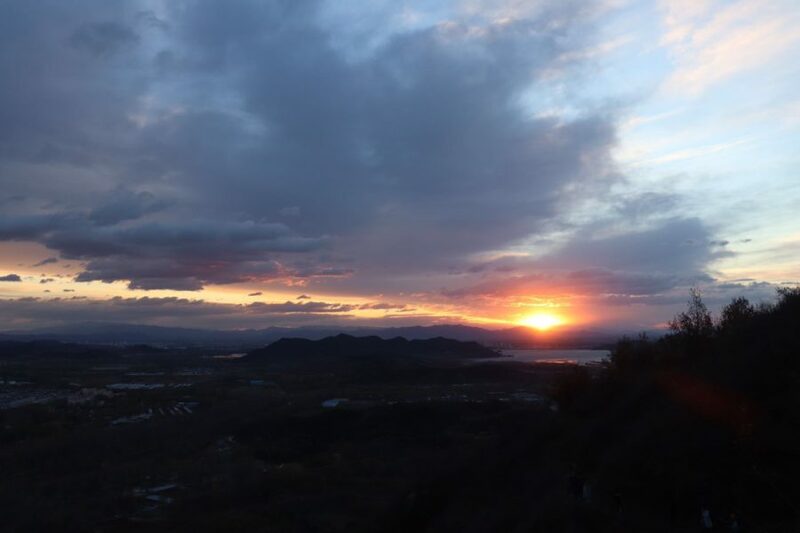 In the morning, I like to hike and watch the sun rise, but there are many people who prefer to not wake up at 5:00 am. In the afternoon the next day, we do the cookie dance (a camp tradition), testimony time, and then leave on the buses. Wow! That sounds like quite the weekend. So out of all the things that happen, what is your favourite part of camp? Jeannie: Time with friends, the night game, gaga ball, music, testimony time, the cookie dance, and the hike…so basically all of it. Lukas: Personally, I love the worship time! I know that sounds like the Sunday school answer, but there’s really nothing like pouring your heart out to God with so many believers from so many walks of life. Can you remember your first camp experience? What was it like? Lukas: I was a little bit nervous, but I fell into the rhythm of things and had a blast! One of my most vivid camp memories was looking out the bus window and just seeing a swarm of campers jumping up and down, banging on the bus. Jeannie: I was mostly excited. I had been to a slightly comparable camp in the U.S. when I was younger, but this camp blew my mind. I felt God really intensely, and it was one of the best things I’ve experienced. Cool! How does church camp in China compare to that camp in the U.S.? Jeannie: I have been to only the one church camp and several sessions of VBS (Vacation Bible School). They were great, but youth camp is so much better because they understand you more and they go deeper. What about youth group? How is attending camp different from attending a typical youth group each week? Lukas: What sets camp apart is all the different people you meet and the effort all the leaders put into making camp the best experience for you. Cabin times, awesome games, and just the time spent over an entire weekend. Jeannie: Camp is like expanded, intensified youth group. You stay there longer, there’s more people, and there’s different things to do. Have you made new friends because of camp? Or have existing friendships grown stronger because of it? Jeannie: Friendships are strengthened through sharing during cabin time and the weird things we do together. I’ve made new friends through playing games and talking with mutual friends. Lukas: Most of my friends go to camp, and it’s a great time to hang out, worship, and make crazy memories from the games and activities! Some of my favorite memories with friends were made at camp. I’ve met a number of people there, and my friendships have only grown through it. Both of you have mentioned being amazed by the worship, messages, and the intensity of camp. How would you say that camp has helped you grow spiritually? Lukas: Camp has become a retreat for me to reflect on my walk with Christ, and it’s always refreshing to come back every Spring and Fall. The messages speak into my life, and the worship environment is amazing! Jeannie: At the end of one camp weekend, I gave my testimony and sharing helped me to talk about it with others. Seeing everyone praising God during worship is also very encouraging. Amazing! Clearly a weekend at youth camp is often spiritually charged and we may feel closer to God than on an average weekend. How do campers cultivate their faith when the weekend at camp comes to an end and they return to their regular lives? Jeannie: Most people just go back to their normal lives, but camp sort of leaves a residue of thinking about God which makes it easier to remember to pray after camp ends. Lukas: Part of it is discipline, but also surrounding yourself with godly people who can encourage you in your journey. One of the best ways to do this is to connect with a youth group or a small group! Campers share a dorm with one or two other campers and an adult counselor so often, cabin time allows for strong relationships to form. What qualities make a good cabin counselor? What feedback would you offer these counselors, so they know how best to serve you? Lukas: I think the best thing to do as a counselor is to be responsible and set the example for the campers while maintaining a fun environment. Setting an example doesn’t only mean through maturity, but also with creativity and humor. During cabin times, start with prayer but don’t forget to include jokes, games, and stories. Also be willing and prepared to have deep and honest discussions with your campers. Jeannie: The most important quality in a counselor is the ability to be understanding. If you’re friendly and get the fact that we are TCK teenagers, then it’s usually pretty easy to become friends and have good cabin times. Just be friendly and have fun! It’s better for us if you are having fun too. What about advice for potential campers? What would you say to someone considering camp or attending camp for the first time? Jeannie: Come! It’s lots of fun and is definitely worth it. Expect craziness and God-filled times. Lukas: They aren’t lying when they tell you to bring clothes that you’re willing to get dirty. Be prepared to meet some awesome people and go home with crazy stories. God is absolutely present at camp, and I would encourage you to come expecting a challenge. Most of camp is spiritually charged and as a Christian it can be hard to replicate that in day to day life. There’s a theme to every camp, and to bring that home with you can be hard. Even if you’re not a Christian, you’ll learn something and make memories. That’s very true. Finally, what have been some of your best memories from camp? Jeannie: To me the memory of camp is one big awesome memory, so it is difficult to choose just one. Lukas: Yeah, there’s too many to count. At my first camp they brought 36,000+ dominoes. It was the most stressful event of my life! They also duct-taped as many people to a tree as they could with two rolls of duct tape. After that there was six-way Capture the Flag, a sock game (where there’s very few rules and even fewer socks towards the end), the famed cookie dance, and recently—chicken herding! There’s always a dedicated drama team that theatrically brings out the camp’s theme. Cabin times are always filled with weird foods, pranks, all-night Risk tournaments, and more. Of course, between 10 separate camps I could fill the whole page with memories, but these are some of the ones that stick out right away. I’m sure the memories are endless and very precious! Well guys, personally I can’t wait for camp next month and I’m sure many readers will sign up to attend or serve if they have not done so already. Thanks so much for sharing about your crazy, messy, and God-filled camp experiences! Last week’s post: Ask… Grandparents! To register as a camper or a leader click here or scan the QR code below.